Super impressed with the product and level of service. Strings by mail has earned my business for life. 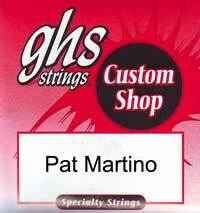 These strings from the GHS custom shop, and that I use on my Eastman arch top, give me the best warm, fat tone I have ever achieved. Great sound and great value. I like the quality of Thomastic strings but this set has the right guages. The guitar seems to tune itself with these guages. It doesn't pull.